We know, geography isn't everyone's specialty. If you only have a vague idea of where Noumea sits on a map, be sure to brush up on its location before you jet off! It sits approximately 7 miles (11 kilometers) from Dumbea and 9 miles (14 kilometers) from Mont-Dore. Visitors to this part of New Caledonia share space with about 93,000 people. 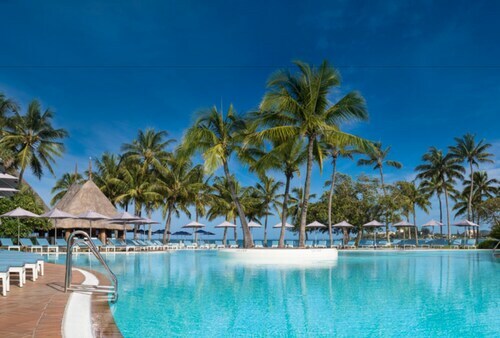 If you're planning an escape to Noumea, you'll want to listen up! It's possible to save heaps by locking in a Travelocity flight and accommodation package deal. Simply select from no less than 400 airlines and 665,000 lodging options. Too many choices? We'll make it easy for you! Looking for a stress-free getaway experience? Our Customer 1st Guarantee gives you 24/7 personal assistance on all of our services. Seen a better deal? We'll meet the price and reimburse the difference^. All package reservations may be easily rescheduled or canceled with no hidden fee from our end. And as long as you get in quick, most accommodations don't charge fees either^. Preparing to venture down the path less traveled in Noumea? Before you begin that fabulous adventure, you'll need a bed to sleep in. Take your pick of Travelocity's 10 properties and get your travels off to a great start. You're on vacation! It's the ideal time to indulge in life's little luxuries. 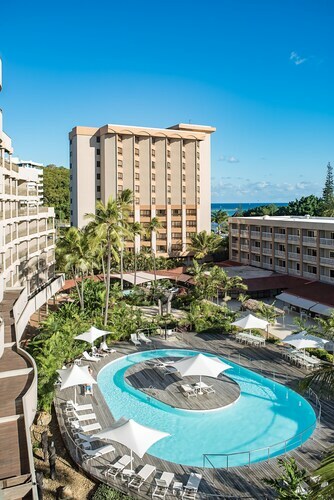 Make a reservation at the Hilton Noumea La Promenade Residences (109 Promenade Roger Laroque) or the Chateau Royal Beach Resort and Spa (140 Promenade Roger Laroque) and enjoy excellent service and a decadent room. More of a budget savvy adventurer? The Casa del Sole Apartments (10 Route de l'Aquarium Baie des Citrons) and the Hotel Le Paris Noumea (45/47 Rue De Sébastopol) may be more your style. Where do you fly into for Noumea? Arriving at Magenta Domestic Airport (GEA)? After you've stepped off the plane and collected your luggage, central Noumea will be just 1 mile (2 kilometers) away. 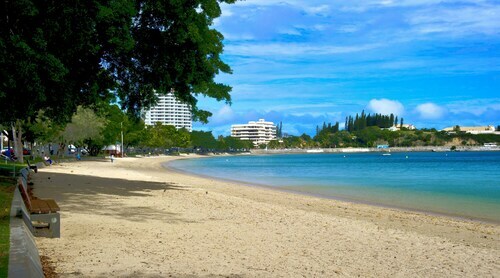 Can I rent a car in Noumea? Plane tickets to Noumea? Check. Road trip playlists? Check. All that's left to do is choose a set of wheels via Travelocity. You'll be driving down the highway in next to no time! If you're getting in by plane, you can simply pick up a rental vehicle from Magenta Domestic Airport. Sixt is the place to look for. It's useful to know that you can rent a vehicle not far from the city center. Positioned at Rond Point Magenta Plage 2, Sixt will get you behind the wheel in no time. Another convenient outlet just 2 miles (3 kilometers) from the center of the city is Europcar at 128 Route De L'Anse-Vata. Enjoy a walk near the water at Noumea Harbour and discover how many kinds of boats you can name. Offering glorious sea views, it's a popular hangout for those who love sailing. Like some more ideas? Attended for worship and spiritual reflection, Noumea Cathedral is a distinguished holy landmark. That said, you need not be the church-going type to take in this soothing space. But there's more. If the kids are tired of sightseeing and need some exercise, why not take them on an outing to Place des Cocotiers? It's the ideal spot to have a running race and toss a ball around. So you've hopped off the plane in a new destination — what do you do? Well, why not bide your time and see what fantastic experiences and unforgettable adventures blow your way? After all, isn't that what travel's all about? If you're looking to travel a little, you could check out Yate, which is 35 miles (56 kilometers) from Noumea. Yate Beach is just one of the things to see and do here. Need another excuse to check it out? You might also like to check out Cape N'Dua Nature Reserve. Located in Nouméa, this beachfront hotel is in the entertainment district and within a 15-minute walk of Grand Casino and Anse Vata Beach. Noumea Harbour is 3 mi (4.9 km) away. 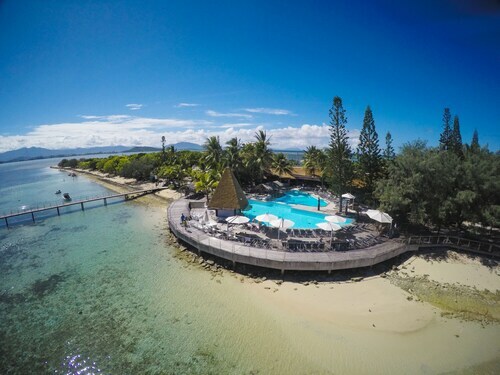 Offering direct access to the beach, this Nouméa hotel is connected to a shopping center and within 1 mi (2 km) of Aquarium des Lagons and Anse Vata Beach. Noumea Harbour is 2.1 mi (3.4 km) away. Situated on the waterfront, this hotel is within 1 mi (2 km) of Grand Casino and Anse Vata Beach. Noumea Harbour is 2.6 mi (4.2 km) away. Situated by the sea, this hotel is within 1 mi (2 km) of Aquarium des Lagons and Anse Vata Beach. Noumea Harbour is 1.9 mi (3.1 km) away. 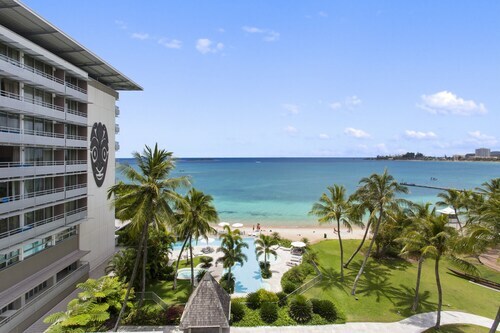 This family-friendly Nouméa hotel is located by the ocean, within 1 mi (2 km) of Aquarium des Lagons and Anse Vata Beach. Noumea Harbour is 2 mi (3.2 km) away. 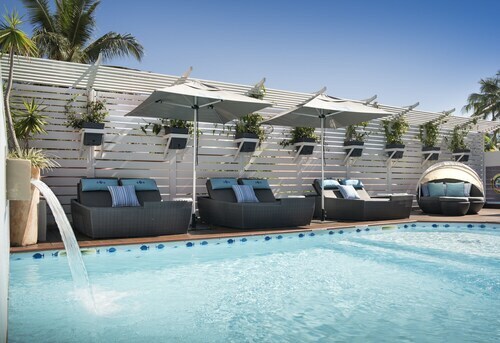 This Nouméa hotel is located on the waterfront and situated on the beach within walking distance of Maitre Pier. Situated by the ocean, this hotel is within 1 mi (2 km) of Aquarium des Lagons and Anse Vata Beach. Noumea Harbour is 2.3 mi (3.6 km) away. 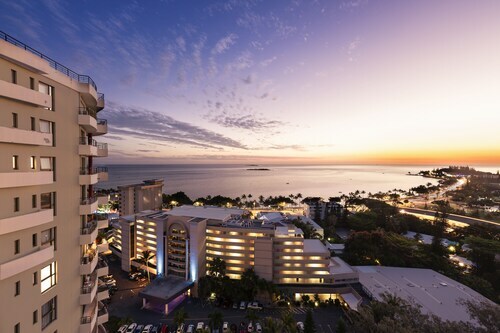 Located in Nouméa, this beachfront hotel is in the city center and within 1 mi (2 km) of Grand Casino and Anse Vata Beach. Noumea Harbour is 2.7 mi (4.3 km) away.